Changing customer demands are transforming the manufacturing industry where organizations must incorporate flexibility and agility into their supply chains to create value and sustainability. As customers want more custom products, quicker, manufacturers must ensure their assembly line is agile enough to meet these needs while keeping costs in check and speeding time to market. In a recent survey conducted by Grant Thorton for the National Association of Manufacturers, 48 percent of respondents say that customer demand drives their supply chain strategy, along with the need for speedy delivery and enhanced customer service. Today’s manufacturers are measured by their superior products, excellent customer service and quick time to market. Lineside storage systems help manufacturers and assembly operations speed assembly and production to bring products to consumers as quickly and cost efficiently as possible. By storing smaller components in separate containers, workers can quickly and easily grab parts to complete their work on the assembly line. Lineside storage systems often have sloping racks so that bins holding parts are easily visibility to workers. 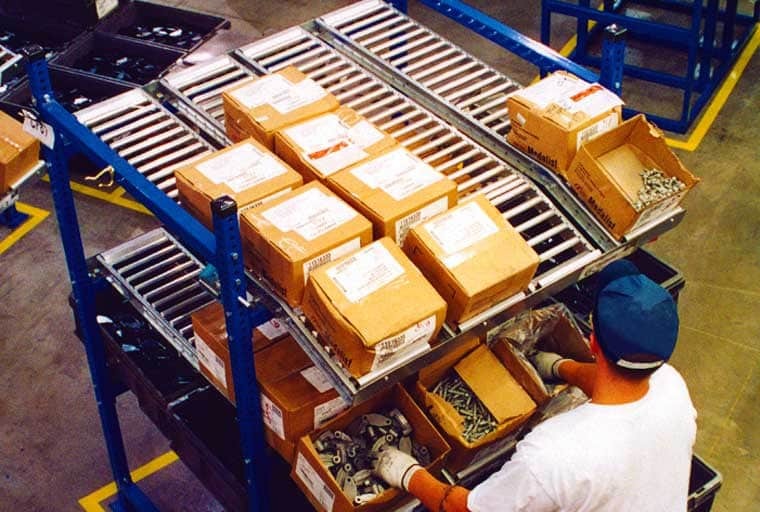 If the storage systems have sloping shelves containing boxes of parts, once a box is picked, the ones behind it will slide forward, ready for the next worker to pick from it. This simplifies stock replenishment and ensures you are picking the products stored first in, first, in case they have an expiration or use by date. Manufacturers need to make sure that when the products arrive at the lineside assembly areas that they are labeled clearly and packaged well so that the contents can be easily identified. The less time it takes the assembler to visually recognize the part needed, select it, pick it and prepare to install it, the less time is wasted having to search for an item. In an automotive assembly line, instead of individual parts delivered to the line, kits housed in totes, are brought to the workstations. These kits give workers the parts and tools necessary to complete the specific components they are building. Assemblies, such as steering wheels, can be delivered to lineside assembly areas to be installed into dashboards. To transform your manufacturing operations and assembly areas, you need to better manage the materials in those areas – from where they come into the area, move through it and leave – which will improve productivity, quicken delivery schedules and enhance customer satisfaction. Employees will be less frustrated not having to search for a particular part to finish their assembly. UNEX provides lineside storage solutions that improve your assembly line's Pickability. When customization is high in your operations, having the ability to store additional SKUs in the assembly area means pickers don’t have to travel to find the right part, speeding fulfillment rates. Efficiencies and productivity are increased as well. Speedier part turnover means speedier lines and happier customers.